Lobster prices are collapsing, but market-price lobster meals aren’t getting any cheaper. A bumper crop is pushing lobster prices through the floor, so why aren’t restaurants charging less? An overabundance of lobsters in Maine has driven wholesale purchase prices to record lows. The Fisherman’s Friend in what passes for downtown Stonington, Maine, is ideally situated for a summertime lobster dinner. The town, at the southern tip of Deer Isle, has a Main Street that runs along the water and is lined with galleries and tourist shops. The town’s working harbor is a place for not only recreational boaters but also commercial fishermen. Nearly atop the harbor is the restaurant, with an indoor dining room and also outdoor seating. You can enjoy the view, the sea breeze, and a lobster dinner, with the crustaceans offered at market price, which turned out to be $20.99 last week when my father and I ate there. I’d say it was money well-spent, but some unease still set in. After all, it was only a few weeks ago that the New York Times’ Katharine Seelye wrote a Stonington-datelined article about the rock-bottom prices lobstermen were getting for their catch. Indeed, these days the dock price of lobsters is about half of what it was four summers ago when Daniel Gross wrote about cheap Maine lobster for Slate. The mechanism isn’t precisely understood—people think the anomalously warm temperatures in the Gulf of Maine may have something to do with it—but newly molted lobsters started showing up in coastal waters unusually early this year, and fishermen keep pulling in record harvests. That’s led to a collapse in the wholesale purchase price of lobsters and international tensions as Canadian lobstermen seek to keep Maine lobsters out of Canada’s lobster processing factories. The state’s governor, Paul LePage, dedicated his Aug. 10 radio address to the lobster crisis, calling on Maine to build some lobster processing facilities of its own so as to capture more of the total value of the lobster industry. Which brings me to the market-price anomaly. It’s clear that if you walk into a fish store that the price of live lobsters has indeed fallen sharply. But at the restaurants and seafood shacks that dot the coast, prices have fallen only modestly. Instead, the lobstermen’s pain is leading to windfall profits for restaurant owners, fueling dark talk of price fixing in some quarters. The price of lobster, like the price of anything else, is set in a market. But the market price you pay is fundamentally a price determined by the restaurant market, not the market for lobsters. And the issue is a basic one of capacity and competition. Think back to the Fisherman’s Friend and its excellent location. Stonington is a great place to visit. But it’s also a very small town. There aren’t very many places to eat. And if it’s a certain kind of coastal Maine seafood dinner experience you’re after, there aren’t any other places in town to go. 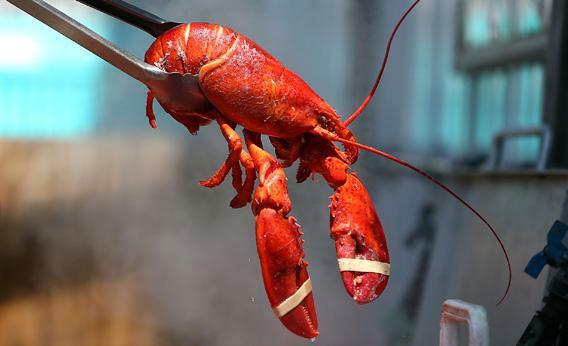 There’s a little reason to fear losing customers to the boil-at-home option as lobster prices fall but no reason to worry about a nearly identical competitor next door poaching your customers. Nor is there a nearly identical competitor next door whose customers you might hope to poach with a discount. Capacity constraints are also an issue. I was a bit taken aback to discover that Fishnet, the classic, fast-food-style seafood joint in Blue Hill, Maine, was selling lobster rolls that were expensive even compared with the (admittedly somewhat inferior) wares available in the next town over. But when I went to Fishnet, parking spaces were scarce, the line was long, and it was a bit of a struggle to find a picnic table to eat at. In other words, even radically lower prices would do little to increase sales, simply because the restaurant lacks the capacity to serve many more customers. To an extent, cheap lobster should spur the spread of lobster as a menu option outside of Maine. But transporting live creatures in a tank full of water is inherently difficult and expensive regardless of the dock price of the lobster. The state government’s strategy is to invest money in a marketing campaign, hoping to increase the long-term size of the market for Maine lobsters. Even if this works, however, there’s no getting around the transportation logistics issues. That’s where LePage’s dream of processing plants comes into play—cooked and individually quick-frozen lobsters can be shipped worldwide with ease. Another option would be more restrictive fishing rules. Whatever’s behind this year’s anomalous boom, the general trajectory of lobster catch sizes has been up since 1990. This is largely a fisheries management success story. Lobstermen are restricted to using certain traditional traps, limited in the number of traps they can set, and required to send back lobsters that are either too small (and hence immature) or too large (and hence proven mega-breeders). These steps have worked to bolster lobster populations even as fisheries around the world are collapsing from overfishing. Still, lobsters remain much rarer than they were in the 19th century before the rise of the commercial lobster fishery. Somewhat restricting the catch would boost prices and further bolster conservation efforts. Another possibility is just doing nothing. Limited competition and capacity constraints are driving low retail lobster prices and restaurant profits right now. But if those profits are sustained, they’ll spur investment in new capacity, both for lobster processing plants and lobster restaurants. This week, 23-year-old Mainer Kyle Murdock opened a new processing plant in Tenants Harbor, Maine, and if this year’s huge catch is followed up by another strong season next year, his won’t be the last. By the same token, sustained cheap lobster prices should create opportunities for people to open new restaurants or shift existing ones into larger buildings. Ultimately, that would push lobster prices back up while maintaining today’s high sales volumes, leaving fishermen with more income than ever before. Of course whether the boom can be sustained is an open question. Some think the same dynamics that created this year’s large catch will lead to a population crash next season. But even though the lobster boom has created some short-term pain for lobstermen, they should hope that the population crash doesn’t happen. In the long run, the whole state’s economy will benefit if sound fishery management and a dose of good luck leads to a permanent new era of plentiful lobsters.